I received my February Golden Tote this week. The chosen items for February were great, so I couldn't resist getting a large tote. And then seeing the clothes on others I also ordered a $49 tote this month, but I haven't received it yet. I've been going a bit overboard with Golden Tote lately because I have a weakness for clothes and Golden Tote always provides an amazing deal. 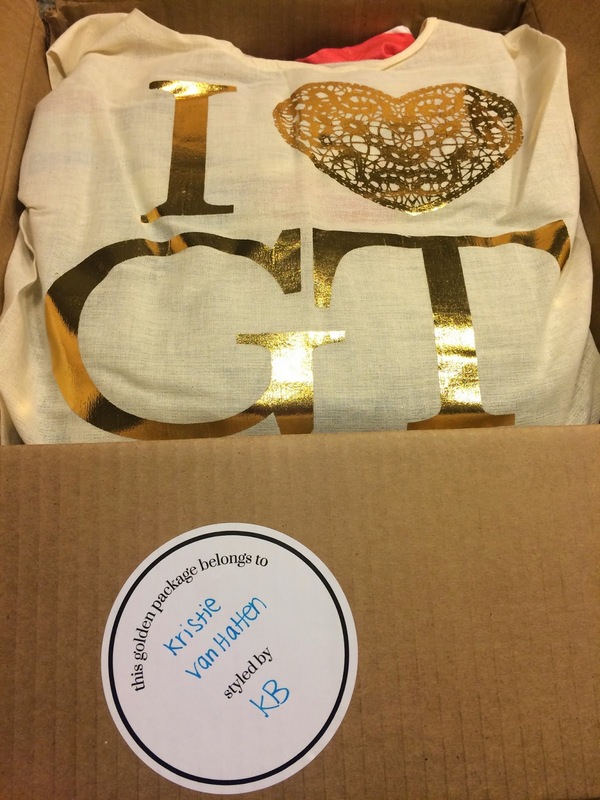 And even if I receive items that are not me, I can usually trade them on the Facebook Golden Tote Trading Group site. Here is a peek at the tote bag that Golden Tote designed for February. They also started using adorable stickers to put the stylist who curated your tote. I love them!!! 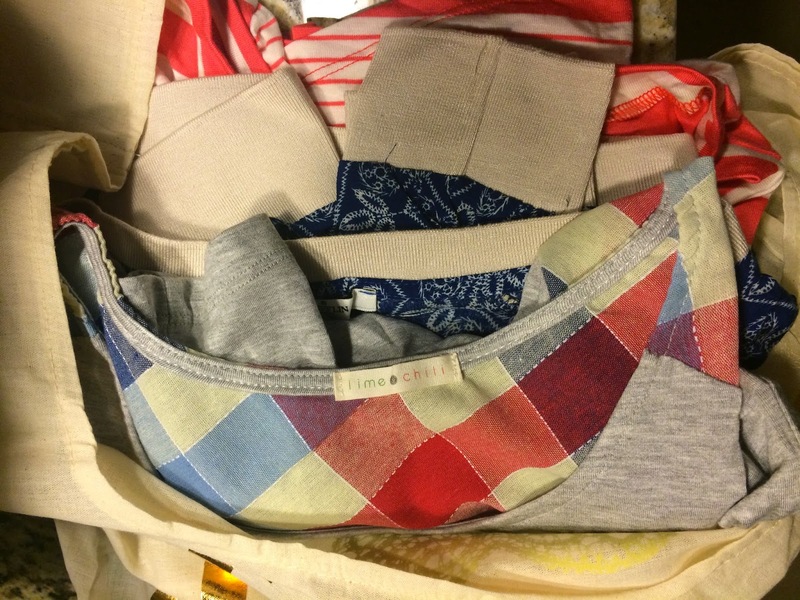 And here is a peek at what I saw inside the tote! I was definitely liking the color I was seeing!!! I'm going to apologize now for my pictures in this review. We have not had much sun lately, so my pictures are quite dark plus I tried to take them myself this month, which I'm not very good at. Sorry in advance if you can't see all the details of my outfits. With the $149 tote, you choose two items and then you receive 3-5 surprise items. The first item I selected was the Alexa Dress by Le Lis in black/beige. I loved the style of this dress with long sleeves and a pleated skirt. This will make dressing for work easy and with the winters in upstate NY, I knew I would be able to wear this for a few more months before we start getting warmer weather. I also added on a tassel belt, that I'm wearing in this photo, but it will be difficult to see because the ivory sold out real quick and I was only able to snag black. I know I'll get lots of wear out of the black though! And this dress is very comfy and adorable! I love it!!! The other item I selected was the Webbed Trim Tunic by Collective Concepts in navy. I was a little nervous that ordering my normal size small was not the right choice, because this looked like it ran large. It also sold out very quickly so there was no chance I could order a smaller size. Luckily when I tried it on, it fit great, a bit blousy, but I liked it a lot. This blouse is great! I love the detailing that makes it unique and it can be worn tucked in or not. It will also look great with skirts, dress pants, jeans, or whatever. I love the versatility! Golden Tote also offered mint skinny jeans as one of the selected items this month, which looked amazing with this top. I thought about ordering them, but then remembered I own mint colored cords, that are pictured below. Ok, now for the surprises! The first surprise I received was a Lime & Chili grey dress with plaid shoulders and cuffs. This dress is really comfy and feels like I'm wearing an over-sized t-shirt. It looks cute worn as a dress, but I think I may also wear it with skinny jeans or leggings as a tunic too. I was very happy with this dress and know I'll wear it!!! The next surprise I received was a Grifflin Paris top in navy. This is different from anything I own. It looks like a patterned sweatshirt, but it's actually a blouse material. I decided to try to style it with a skirt. I actually really like this shirt (many people are trading them on the Facebook Golden Tote Trading Group)! I think it will be great with jeans or skirts and I was happy to receive it!!! I also received a Lime & Chili coral striped shirt. I love the swing style shirts and this one has cute button details and an asymmetric hem that I really like. It's very comfy and I know I'll wear it all the time. I was so happy I received this in the coral color, because I love bright, cheery colors, especially when winter is seeming too long! The final item I received was one I was a bit unsure of at first. It is a Newbury Kustom shirt in green. At first I thought with the cut of this shirt and color, it would look like I was wearing scrubs. I liked the color, but didn't want to be mistaken for a nurse. The material is very soft and this shirt fits great, so I decided to style it with a tweed jacket and statement necklace to look more polished. I love it!!! I will definitely wear this and hopefully people won't assume I'm wearing scrubs. I was very happy with every item in my tote this month and I decided I will not be trading anything. 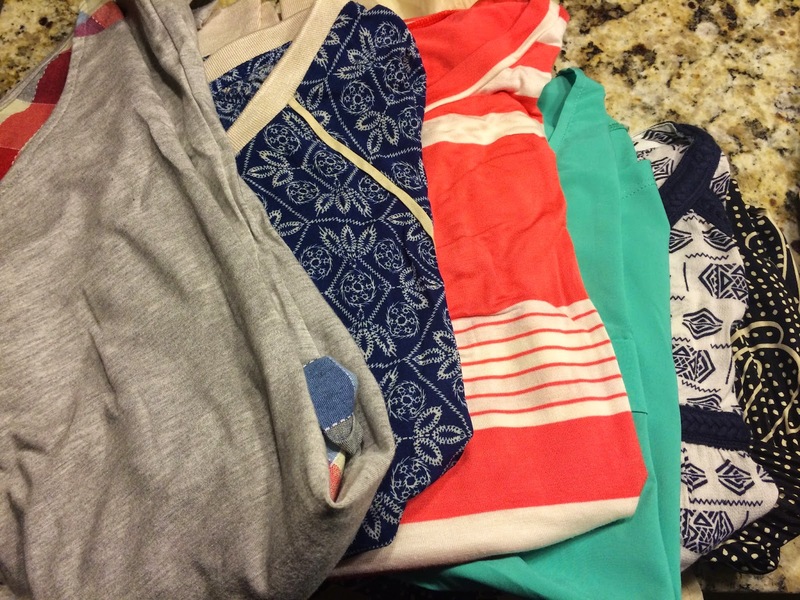 I also ordered another $49 tote this month with the coral skinny jeans as my chosen item and begged for a couple surprise items I've seen and love! I'll review it later in the month when I receive it. It hasn't shipped yet. Golden Tote also had items available in the beginning of the month for Valentine's Day and of course there were a few things I couldn't resist. The first item I had to have was this t-shirt by Chris & Carol. I felt the need to declare my love of Golden Tote to the world. And this shirt is very comfy, so I'll wear it lots! I also purchased this navy Heart on Your Sleeve cardigan by Moon Collection. I needed a new navy cardigan and I couldn't resist the heart elbow patches. I wore this for Valentine's Day, but I'll also keep wearing this all year long. I really need to slow down on my spending at Golden Tote, but I have been loving everything lately, and it's so difficult to control my shopping addiction. I'm a bit worried about seeing what they offer for March, because I'd like to take a break for a month, but I know I won't be able to.